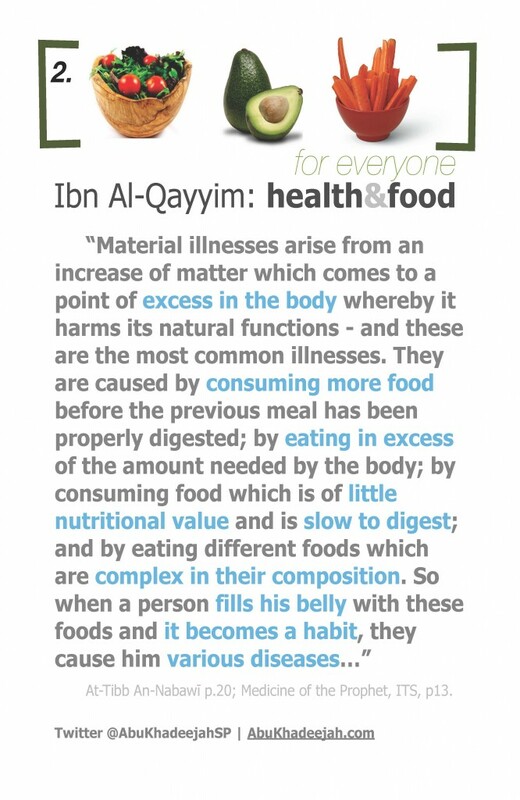 So the Sunnah encourages with moderate eating and not constantly indulging oneself because that eventually leads to poor health and illnesses. At-Tibb An-Nabawī p.20; Medicine of the Prophet, ITS, p13. So here we see this great scholar highlighting that which has been known throughout the ages till this very day of ours by the experts in the field of nutritional and holistic medicine – and that is the harm that comes to the body due to overeating, to the point of excess, beyond what the body needs even before the previous meal has been digested. People today are no longer in the habit of feeling hungry as our ancestors were – they desire to be satiated constantly throughout the day and night. This constant filling of the stomach to excess leads to illnesses that have become widespread in societies today. 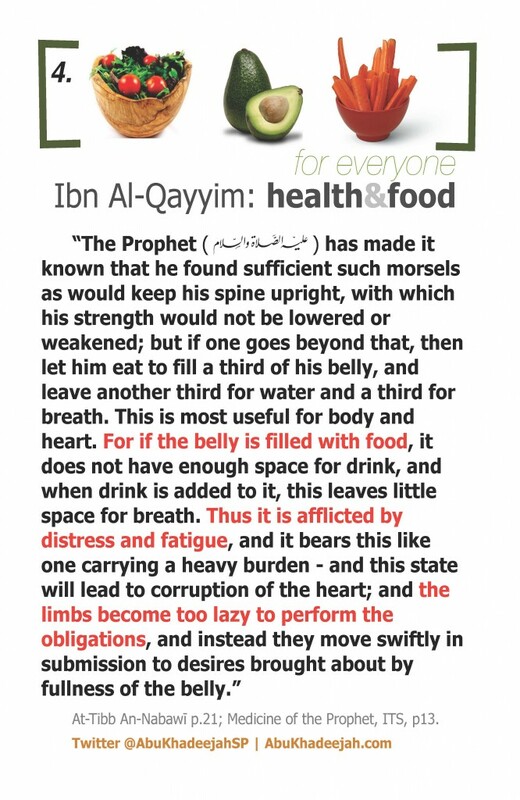 This is where fasting is an excellent habit to get into at least twice a week (as the Prophet recommended) or even once a week, as it curtails the desires, it is a spiritual nearness to the Lord, a cleanser of the digestive tract and helps in weight loss. And when you break the fast, you do so with simple healthy foods. Another important point mentioned by Ibnul-Qayyim is the harms of consuming food of low nutritional value that is complex in nature and therefore slow to digest. 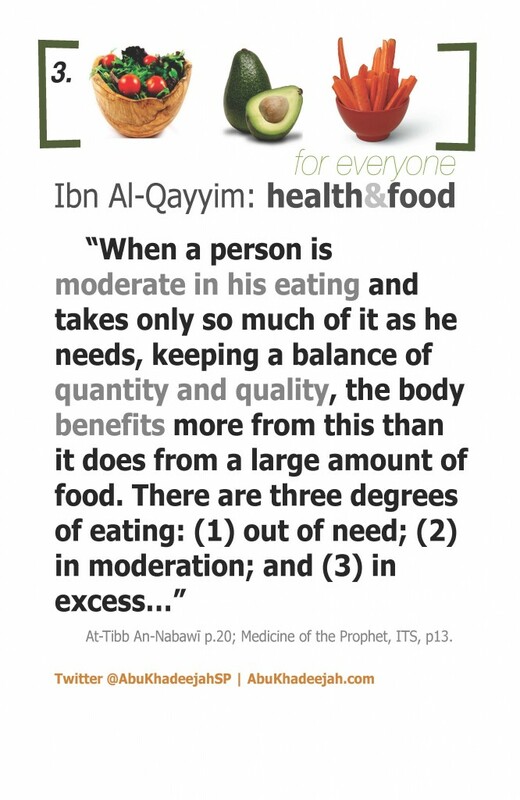 Today we hear of cases where people may be morbidly obese, yet malnourished at the same time because they’re not getting the right type of nutrition-rich food. The modern diet of complex processed foods that has become a norm in many households leads to illnesses and diseases that were unheard of by our forefathers (or were at least extremely rare). The less processes your food goes through before you consume it, the better. The closer it is to nature, the better. The simpler it is, the better. So organic raw (fresh) milk is better than pasteurised and homogenised milk; butter is better than margarine; raw vegetables are better than fried; a baked potato is better than fried chips or french fries; steamed vegetable are better than boiled; home cooked food is better than fast food from a takeaway restaurant; organic fruit and vegetables are better than those sprayed with chemicals; organic and free-range meat and chicken is better than those injected with antibiotics and hormones and fed with “food pellets”; organic free-range eggs are better than eggs from caged chickens; butter, ghee (clarified butter) and coconut oil is better than vegetable oils; grilling and baking is better than frying (deep frying is bad for health); a homemade cake using good and natural ingredients is better than a supermarket one; non-GM (non genetically modified) is by far better than GM; all sugary foods and drinks are bad for health (even the concentrated juice drinks). Watch out for packaged foods and meals with long lists of ingredients and chemicals; try as much as you can to cook at home with simple basic ingredients involving simple processes (steaming, grilling, baking, boiling, etc) – remember, the closer to nature the food is, the better. Eat plenty of leafy green salads and colourful vegetables (organic whenever possible) – use butter, olive oil, avocado, vinegar to add flavour. Organic may not be affordable for everyone, in which case think about buying from your local farmer or visit farmers’ markets, or consider growing you own – and if all of that is not possible, then buy the non-organic greens and wash them thoroughly! Beware of refined carbohydrates – refined carbohydrates are rapidly absorbed into the bloodstream, causing risky spikes in blood sugar and insulin levels. Most common chronic diseases of Western Civilisation have been tied to these types of (deliciously addictive) carbohydrates, therefore it is wise to keep them to a minimum. Examples of foods that are refined starches include white flour, white bread, white pasta, white rice and cereals that contain little to no fibre. Carbs that have been refined digest very quickly, which can lead to surges in your blood sugar level. You may find that after a blood sugar surge, your energy drops. You may also experience food cravings, which, if you’re trying to lose weight, can hinder your success. Generally, anything that comes in a box or bag (think chips/crisps, crackers, biscuits and pretzels) has been refined. Learn which carbs are refined and scratch them off your grocery list forever. 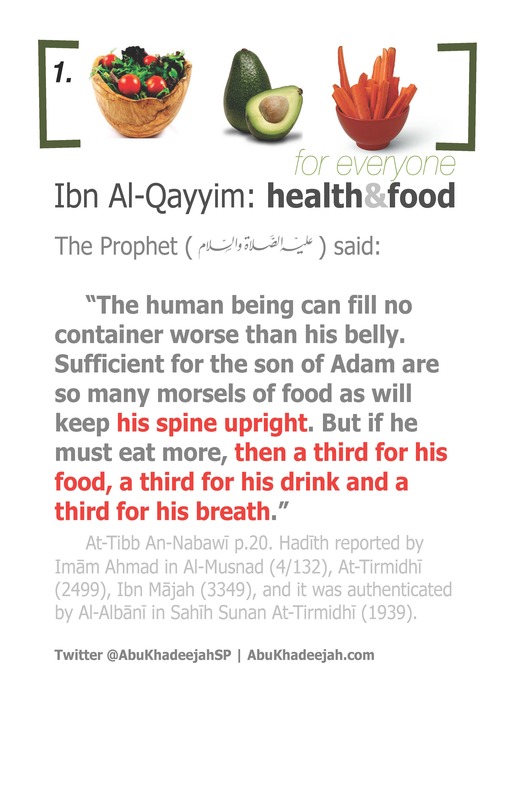 At-Tibb An-Nabawī p.21; Medicine of the Prophet, ITS, p13. Jazaakallaahu khairan for this article which I have read many times. However, recently I have been afflicted with some health issues and the article has been an excellent reminder of my shortcomings. I wonder if brother Abu Khadeejah would do some more in depth advice on this topic, especially on what is “Halaal and Tayyib” . I feel there is much to be learned on this topic which would be beneficial to a significant proportion of our community suffering with illnesses and diseases arising out of poor nutrition.